Royal Gun Salutes mark special royal occasions. 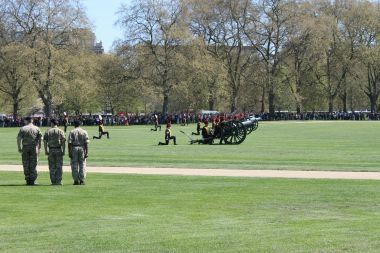 On these days salutes are fired from locations in London including Hyde Park and Green Park. 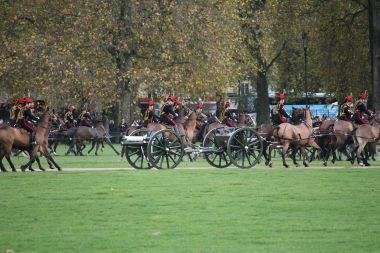 The Kings Troop Royal Horse Artillery towing guns used in the Royal Gun Salute across the Parade Ground in Hyde Park. You need to be signed in to download images. 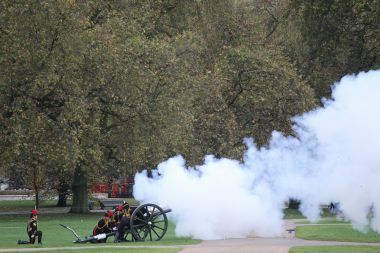 Gun firing during Royal Gun Salute in Hyde Park. Cannons all lined up and ready to fire the Royal Gun Salute in Hyde Park.